Off on a trip to visit relatives in Berlin, 11-year-old Emil is robbed of what little traveling money he has. 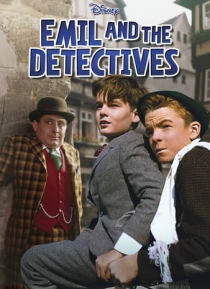 Enlisting the help of the street-wise orphan Gustav and his band of enterprising juvenile detectives they not only track down the crook but they also uncover an elaborate plan to rob Berlin Bank. Without the help of the police or their parents, Emil and his detective friends must use their… wits, brains and courage to bring down this ruthless band of thieves.